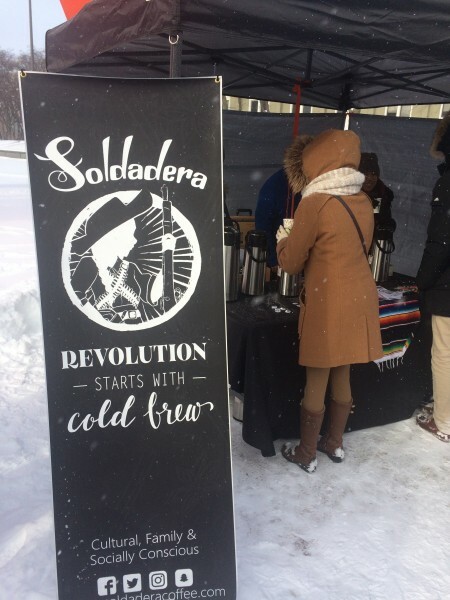 Chilly winds and low temperatures did not deter a crowd of hundreds from showing up at the Calder Plaza in the mid-afternoon of January 19, 2019. 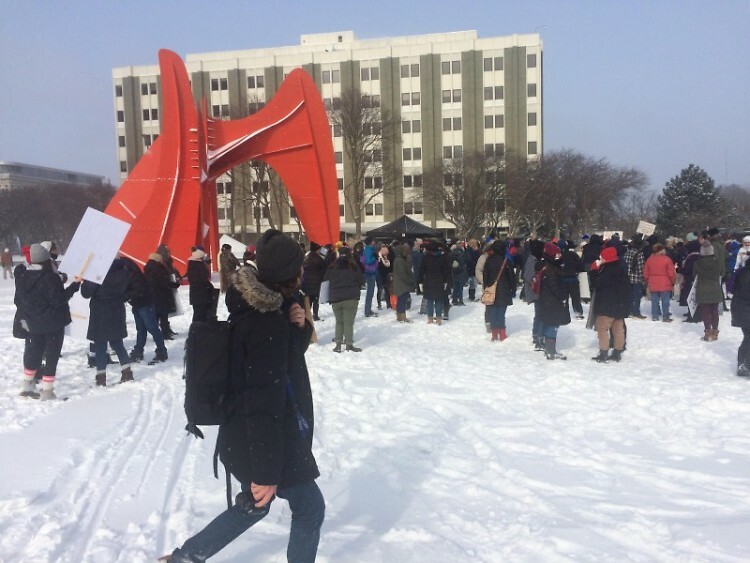 Marchers wearing pink "pussyhats” took to the snow covered streets, hoisting Baby Donald Trump balloons, picket signs, and rainbow-colored flags. 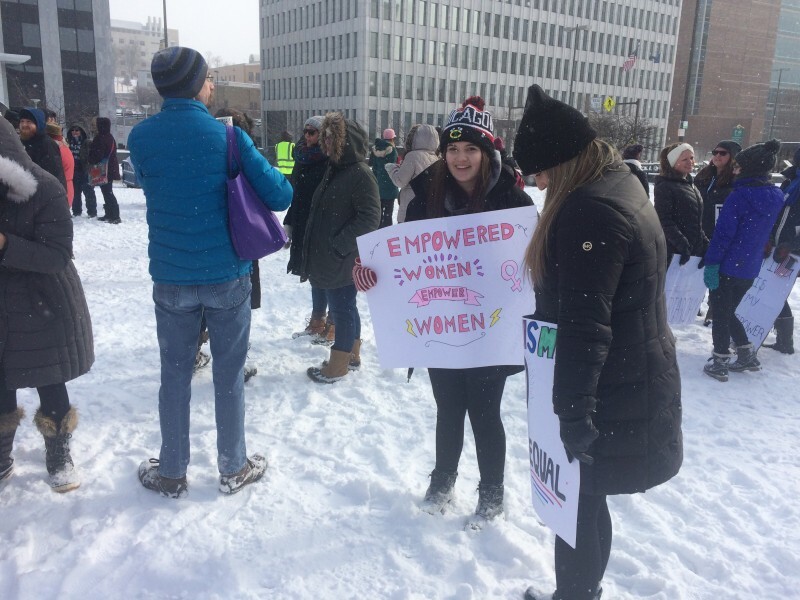 This year, Grand Rapids hosted a third annual Women’s March. The event offered personal testimonies from women speakers and conveyed the importance of intersectionality and activism. Seeing the country’s toxic political climate inspired organizer Raina Cook to bring this year's Women’s March to Grand Rapids. With the help of a team of volunteers, she secured a location, recruited speakers, and generated enthusiasm online. The leadership team promoted the mission of the statewide organization Women’s March Michigan, which states “we are for a Michigan that reflects and protects all its citizens, that celebrates diversity and nurtures the human potential in each of us.” Women’s March Michigan calls for progressive policy measures such as electoral reform, a $15 minimum wage, and pro-immigration laws. Speakers were of diverse racial identities and socioeconomic backgrounds. The selection process sought individuals who represented marginalized communities. Idalia Tinoco spoke as a member of Movimiento Cosecha, a local immigrant rights group. Her speech, which was translated from Spanish to English, recalled traveling from Mexico to the U.S. without documentation or material possessions beyond a pair of shoes. All too often, Tinoco heard people describe immigrants as a threat to society and a drain on the economy. Hearing these concerns compelled Tinoco to share her experience as a restaurant owner, an activist, and a mother. Darmesha Glover described her upbringing in a low-income, religious home in Grand Rapids. Glover’s mother struggled with a neglectful husband, and she acted as the family’s sole breadwinner. Being raised in a chaotic household and feeling isolated as one of the few people of color at City High Middle School caused Glover to experience depression and anxiety. As a child, Glover spent much of her time in church. When she developed a rebellious streak, Glover was called out by her elders as a “disobedient child of God,” who lacked respect for male authority figures. “When you’re a young black girl, when you’re acting out, and you’re anything but happy, you’re immediately labeled as a ‘troubled child,’” said Glover. “It really made me question why things are the way they are. During college, Glover’s depression and anxiety intensified, and she attempted to take her own life. Glover’s gradual recovery compelled her to give back and become an Early Intervention Specialist at a HIV prevention non-profit called the Red Project. “Black women should be allowed to feel anger, passion, and sadness, and they should not be demonized by their counterparts,” said Glover. Cook hoped that speakers like Tinoco and Glover would encourage women to not only vote and attend rallies, but deepen their involvement in the community. The third Women’s March took place two years after the original march, the largest Washington protest since the Vietnam War. Reports state that national turnout decreased due to poor weather, distraction during the government shutdown, and charges of anti-Semitic statements made by some march organizers. Participation remained high in Michigan despite external concerns. Major cities such as Lansing, Holland, and Traverse City hosted sister marches throughout the state.